The Relationship People's Blog: The Anniversary Card! There was a time when we didn't pay much attention to this annual date. It was as if being married for the second time we both wanted to avoid any risk of repeating the patterns and potential difficulties which featured in our first relationships. Over time though this day has become more precious to us - 17 Years feels like quite an achievement and we're proud of it. 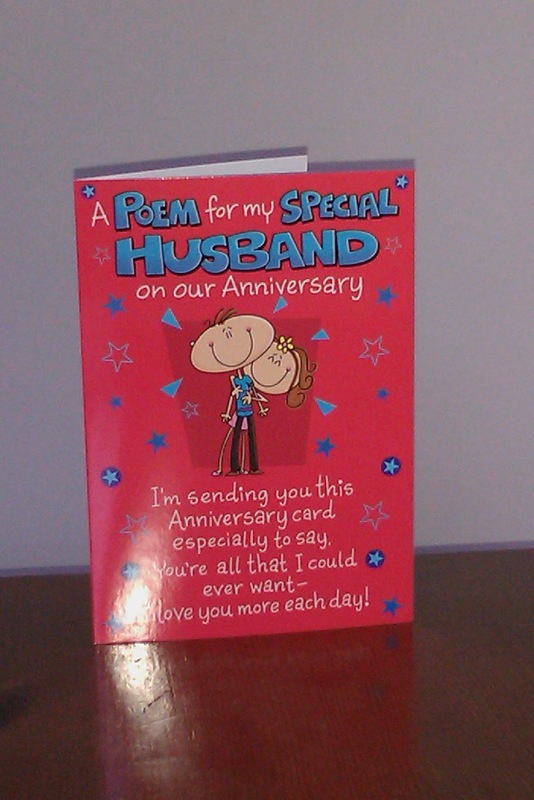 Exchanging anniversary cards has become another way of sharing what our love means to us. This year my card for Nigel has its own story to tell! Between working together and living together Nigel and I don't have much time on our own when we can buy each other cards or presents. So finding more than a moment when I can choose just the right card is rather more than problematic. And of course I don't always think far enough ahead to make this easier. To be honest when I have seen and bought THE CARD well in advance, I've always hidden it away so securely that I've either forgotten about it altogether or I can't find it! On Monday this week it seemed just the right opportunity had come up as I'd planned to meet another coach for a chat and a coffee in town. I could easily add a little card shopping into the trip out, I thought. But no! Nigel decided he also needed a break - and besides since I would probably be talking about co-coaching, wouldn't it make sense if we were both there? So I rescheduled my shopping to the next day when I would be picking up a prescription and could easily pop into the local garden centre - they have a lovely selection of cards. Except when the time came, I had a million and one other things on my mind and I completely forgot! On Thursday, following a tasty pub lunch with my Mum, we took her to the local supermarket. She also wanted some letters posting and Nigel volunteered for the Post Office run. He was somewhat surprised by the speed with which I suggested swapping duties. I desperately needed this moment to escape to the small arcade of shops! I wasn't overwhelmed with choice - but on reflection that's probably a good thing! As I made my way back to the supermarket I realised I now had a tell-tale polythene bag in my hand which I couldn't hide in my handbag. I scurried back to the car, hoping I could find a spot where Nigel wouldn't instantly see it. I surprised him again as I approached from a different direction. 'How did you get past without me seeing you?' he asked. 'You must have blinked!' I replied, somewhat disingenuously. When we got back home, I secreted the card away in my bottom drawer. Phew! I read your article and you provide a great information for us. Congratulation on your anniversary and your card so very nice. I really impressed with your story and I like it so very much.